Andrew-Lee Potts is back as dino-geek Connor Temple in the fourth series of Primeval, which can currently be seen on ITV1. 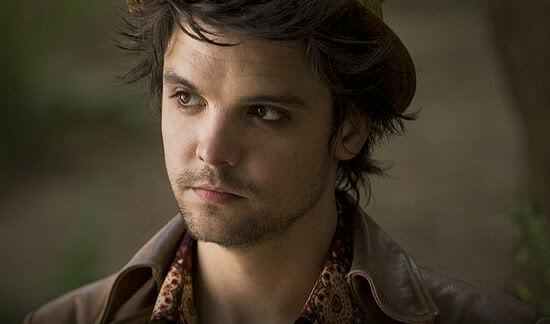 He also plays The Mad Hatter in Alice, Syfy’s two-part reimagining of Lewis Carroll’s masterpiece. “My heart lies in things which are a bit out there,” he tells Matt McAllister. Yeah, it’s a reimagining that has fun with elements of the original story, but it’s very different. When the script came through and I heard they were considering me for the Mad Hatter, I thought, “Brilliant, this is awesome! I’m going to go crazy!” Then I read the script and he seemed so normal in many ways. So I did what I thought was right – make him this kind of wheeler-dealer, uber confident, someone who has probably had many women in his life and has the gift of the gab. I suppose the thing I brought to the character is his inner vulnerability – I mean, we didn’t want to soften him too much, we wanted people to guess whether he was good or bad, but ultimately that quality shone through. [Writer/director] Nick Willing said to me he wanted a cross between Lenny Kravitz and Simon Pegg! [Laughs] I was like, “So is that me then? Is that a compliment? I’m not sure!” But I was chuffed to get the part and put my own stamp on it. Did you go back to the book or watch any other versions for inspiration? Nick did a version 10 years previously [1999’s NBC TV movie Alice in Wonderland], a more classic version of it, and I’d seen that. I was actually attached to a film called Neon Dreams many years ago, which was another reimagining that didn’t come to fruition – I was playing The White Knight in that. So I knew my way round the story a bit. But I didn’t go back to other versions – I’d seen the trailers for the Johnny Depp version, but not the whole film. The whole point of a reimagining is that we were building a new world and a new story. Primeval has given me a taster for heightened reality – it’s quite hard to go back to the norm after that! You know, I’ve done a few British dramas, but I think my heart lies in things which are a bit out there, things where you get to use your imagination. The freedom excites me. I was very lucky with Primeval that I’ve been able to be free with my character, which has helped him grow. I took that to Alice – hopefully it worked! I also think Nick Willing is a magical director. He gets the best out of everybody, but you don’t feel like you’re being manipulated. He just seems to be able to draw energies out of you, which, as an actor, I really appreciate. Also, I was kind of like the male hero in Alice – that was something I never really got to do in Primeval, be the tougher guy, so that was really nice. The stunts were pretty awesome too! After Primeval and Alice, you must be used to working with CGI. Do you still find that a challenge? Not so much now. I know that Caterina [Scorsone], who plays Alice, was kind of struggling doing the scenes with the Jabberwocks to begin with. She’s a brilliant actress, but she was like, “This must be second nature to you!” And now I’m on the fourth and fifth season of Primeval, so I suppose I’m somewhat qualified to work with CGI! I now know the right faces to pull and the right moment to pull them. Then again, it’s a challenge to make everything realistic on a film set – that’s the part I really enjoy. I suppose many actors want the instant gratification of, “Oh that scene went well”. But being on Primeval has taught me you don’t get that on a CGI show – you have to finish a scene and just say, “I hope that worked.” You get used to that. I suppose it was hard at the start but we’ve got so much trust in the CGI guys. The Mill also did the Jabberwocky on Alice. When I saw the new CGI on Primeval it was awesome – the effects are better than they’ve ever been, it’s fantastic! How do you think Connor’s changed in the new series? Hannah [Spearritt] and I really approached it differently this year – the show’s evolved every year, and we really need to evolve as characters too. I don’t want to lose the relationship between Abby and Connor that works, I don’t want to lose the jokey side of Connor, but it was important for us to show they’ve grown up – as our fans have grown up with us. It’s like in that first episode – we’re a bona fide couple and have been a couple for a year-and-a-half, surviving Bear Grylls-style in the Cretaceous period, which is an incredible feat! We’re like this uber-unit now I suppose – we’re in love, so we’d do anything for each other. We’re pretty skilled too; she’s taught me kickboxing, I’ve taught her everything I know about dinosaurs. We’ve become this force to be reckoned with! So there are a lot of changes, a lot of maturity in the characters, but we wanted to keep the level of fun needed. Yeah, it was nice because we got to do the story properly. The carpet kind of got swept from under us at the end of series three, which no one was expecting. Nobody wanted to leave the story there – it wasn’t fair on the fans, it wasn’t fair on the story – that wasn’t how it supposed to end! So it was nice to get the funding to get the new series made. I do think in this series Primeval really finds its feet. It’s been a show that has perhaps strayed sometimes, as the producers and writers – and all of us on screen – have tried to work out what is best. With us having a year off, I think we were really able to nail down many of the key story points that people wanted to know. So we’ve tried to answer a few of the questions about why the anomalies are here and what use they can be. One thing I like is they’ve brought the science back. I mean obviously the action and monsters are fantastic, but we need the science in the show, because that’s how it all started. That’s why Burton, played by Alexander Siddig, is such a fantastic new character – this amazing scientist who takes Connor under his wing. You starred in the films Freakdog and Return to House on Haunted Hill, and had a small role in 1408. Would you like to appear in more movies or do you prefer working in TV? Films are fantastic when they come along – I’d love to get involved in films again, because that’s how I started when I was 18 or 19. Unfortunately, with film budgets and the money situation in the UK at the moment, it’s hard to get an independent British film off the ground, so you look to American funding. And obviously big American films are cast out of America, so there’s not many British actors getting those roles and competition is pretty stiff right now. I’m actually attached to a few upcoming films but they’re not greenlit yet because of the financing. But I think telly’s great, and I love the type of shows I’m involved with.